This test focused on high-end 4×4 APs with one 2.4 GHz radio and one 5 GHz radio. The tested APs and their costs are summarized below. 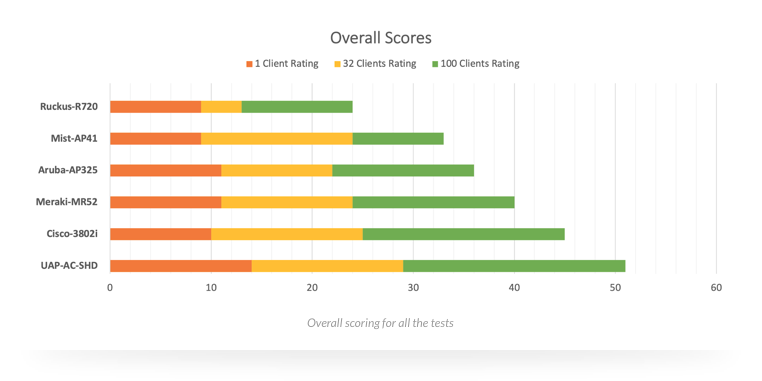 The number of simultaneous clients performing tests were 1, 32, and 100, depending on the test case. Alethea used a classroom environment for the test. They positioned the test AP in the center of the area. All testing was done on the 5 GHz band and the 2.4 GHz radio was disabled. Alethea used the 80 MHz channel for single-client tests and 40 MHz channel for 32- and 100-client tests. The nominal AP power level was +20 dBm. The test team calibrated average received AP signal level at the client to the same level, approximately -43 dBm, for all of the tested APs. AP power level settings were adjusted to equalize the differences. APs have different antenna patterns. Some are focused more downward and others more toward the sides. In a single AP test, the AP with the greatest gain to the sides would have an advantage when there are many clients further away from the AP. In a high-density environment, a more downwards-focused pattern causes less interference to nearby APs and is more desirable. The principles for power level measurements and settings may vary between vendors. Some vendors do not provide certain dBm scale output power settings, only maximum power and power level reduction values. The measured signal level data shows that APs set to the same power level had significant differences in power levels as measured by clients. This calibration step was important to achieve realistic and comparable results. Test data presents the aggregate throughput from all test clients. DL and UL tests were performed separately. 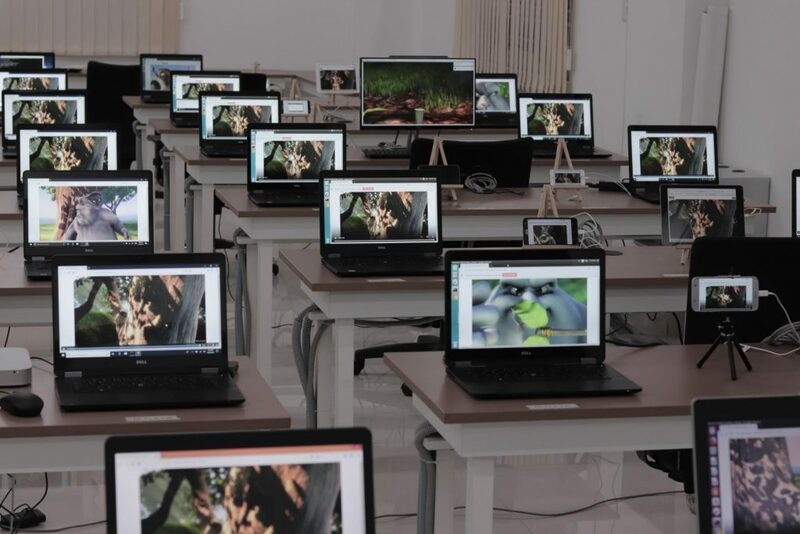 In the DL test, all clients performed a simultaneous downlink transfer. Similarly, in the UL test, all clients performed the UL transfer test. UAP-AC-SHD performs the best in both directions according to these test results. Cisco 3802i performs the best in the DL test; Mist AP41 performs the best in the UL direction. Note the drop in aggregate UL throughput compared to the same in the DL direction. Cisco 3802i performs the best in the DL direction. UAP-AC-SHD is the best in the UL direction in this test. During this test, Cisco 3802i performance decreased considerably (3.5 Mbps aggregate, 0.035 Mbps/client) in the UL direction with 100 clients. It’s worth noting how UL performance is significantly lower than DL performance when the number of clients increases. Several factors contribute to this, including transmitter power level, efficiency of channel access, and Wave 2 MU-MIMO in the DL direction. Cisco 3802i had the best performance, followed by UAP-AC-SHD and Aruba AP325. A mixed traffic test simulates a real network most closely. This test is likely to also be the most demanding. The AP needs to balance between various client types, signal levels, and various applications. Alethea performed the tests with default QoS settings. Below is data for each group of clients performing tests with a certain application. UAP-AC-SHD maintained the highest aggregate throughput while still providing the second highest voice quality (tied) and the second highest video streaming performance (tied). Meraki MR52 had the best voice quality, but it failed all video streaming tests. Aruba AP325 had the best video streaming performance, but only a modest simultaneous throughput. Alethea used a five-grade scale for the overall scoring. The highest and lowest values of each test determined the full range, which they further divided into five equal sub-ranges. Depending on the test results, each AP got a score from 1 to 5 for each test. According to test data, UAP-AC-SHD scored the highest overall, followed by Cisco 3802i. While this may be surprising for some readers, it’s not surprising for us. Performance is an important long-term focus area for our development teams. When selecting the best product for your network, you are likely to consider the balance between performance and cost. I calculated the cost of performance by dividing the cost by the overall score. In addition to the leading performance, UAP-AC-SHD provides exceptional value. The cost of performance is only 18-25% of a competitor’s equivalent. I took this test data from Alethea’s raw data tables and created the summaries in this blog post. Alethea has also published the comprehensive test reports. You can view the reports here. They contain a lot of interesting details and findings which go beyond the information presented in this blog post. For example, it is very interesting to observe the performance differences between client devices with different operating systems. Ubiquiti offers a large variety of Wi-Fi access points for different use cases. You can get a quick overview of all UniFi APs from this knowledge base article. 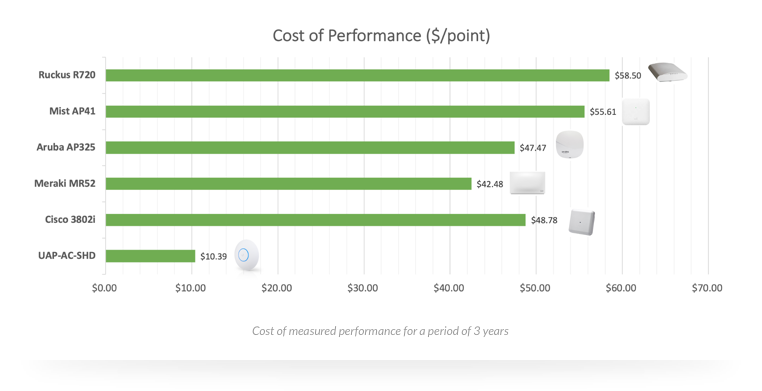 You may be pleasantly surprised by the performance, value, and ease of use Ubiquiti products offer. I encourage you to give them a try.